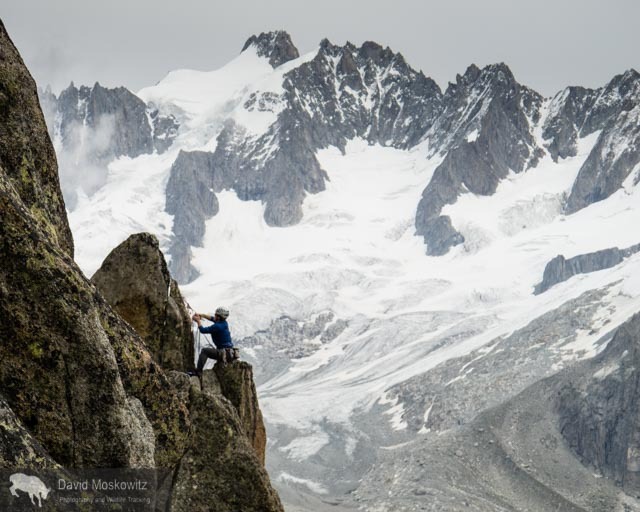 In July and August, I was part of a team of four people who made a mountaineering pilgrimage to the most northern mountain range in North America. The central Brooks Range (Gwazhał in Athabaskan) is the traditional territory of the Inupiaq-speaking Kuuvanmiit and Nunamiut people and the Athapaskan-speaking Koyukon. Today, the landscape we visited is in included in Gates of the Arctic National Park. Forest McBrian, Steph Williams, Drew Lovell and myself spent 3 weeks exploring the Arrigetch Peaks region which comprises two drainages of the Alatna River. My first trip to the Arctic, learning about the beautiful long and low light of summer in the far north was amazing as a photographer. Here are a few shots celebrating the season of light in this expansive and wild mountain range. 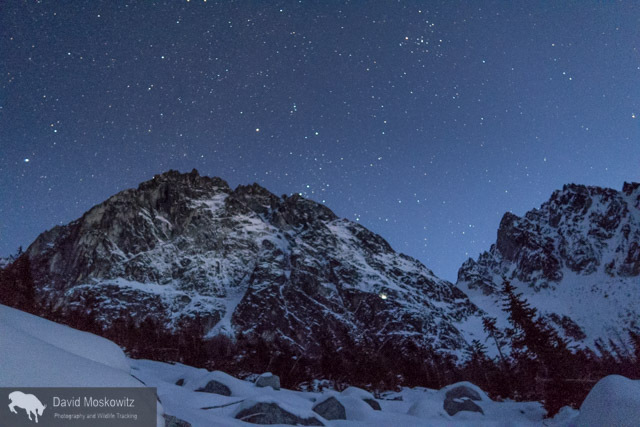 Dragon tail Peak in the moonlight. The Triple Couloirs route starts in the obvious snow gully around the center of the face. Note the headlamps on the right side of the face. From our camp on the lake we watched a party retreat off of the face via multiple rappels in the dark. 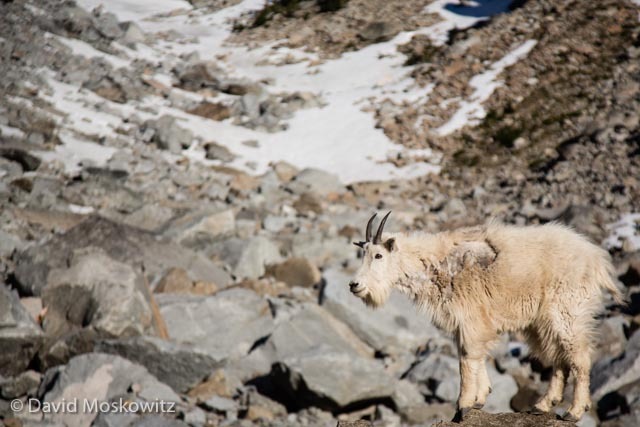 The Pacific Northwest's mild winter has created early spring conditions in the mountains--a more stable snowpack up high and little snow at lower elevations making access to the high country easier. 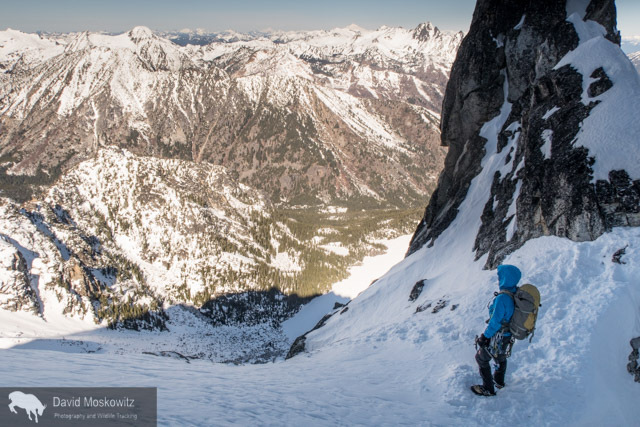 This weekend Cam Alford and I trekked into the edge of the Enchantment range in Washington's North Cascades to take a crack at the classic alpine mountaineering route Triple Couloirs. 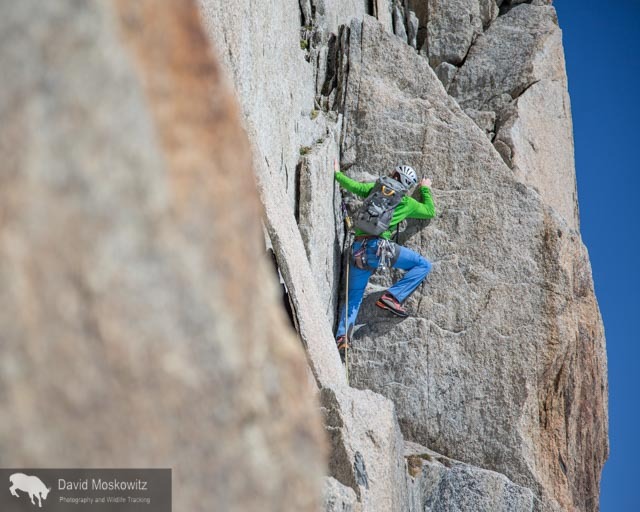 The route is one of several that ascends the northwest face of Dragontail Peak. Cam Alford making his bed for our brief evening at Colchuck Lake, using our climbing rope as part of his mattress. Inspecting equipment for our early morning start. In the moonlight, Cam makes coffee for our pre-dawn start. 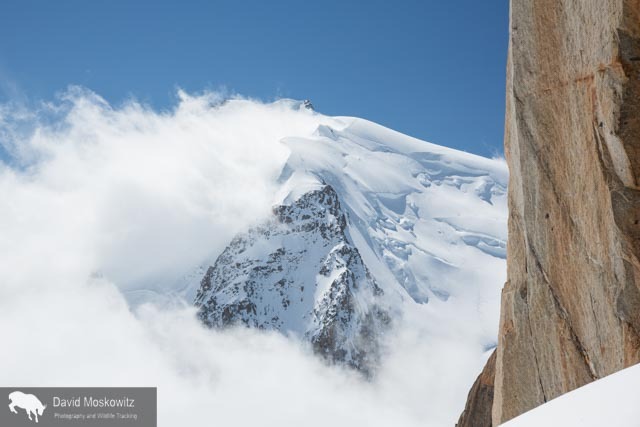 After we left camp at 5 am, unfortunately, my camera stayed tucked in my pack until high up on the route as we navigated three pitches of ice and the first two couloirs. After safely navigating into the third couloir, with all of the significant technical obstacles behind us I snapped a few shots. Here Cam ascends steep snow towards the bottom of the third couloir. Close to the summit of the Triple Couloirs on Dragontail Peak, Cam Alford looks out over the snow covered North Cascades. A strait forward descent around the backside of the mountain brought us back to our camp and several grueling hours of hiking on a very icy trail and gated road got us back to our car and the end of 14 hours of almost continuous movement. Beers and burgers in Leavenworth shortly there after--sorry no photos of that either. 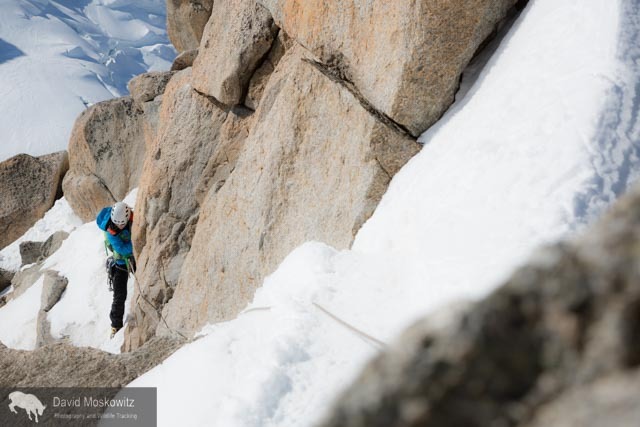 Darcy Ottey on the approach to the Colonial Glacier cirque. Colonial Creek falls off to the left with Colonial Peak above it. 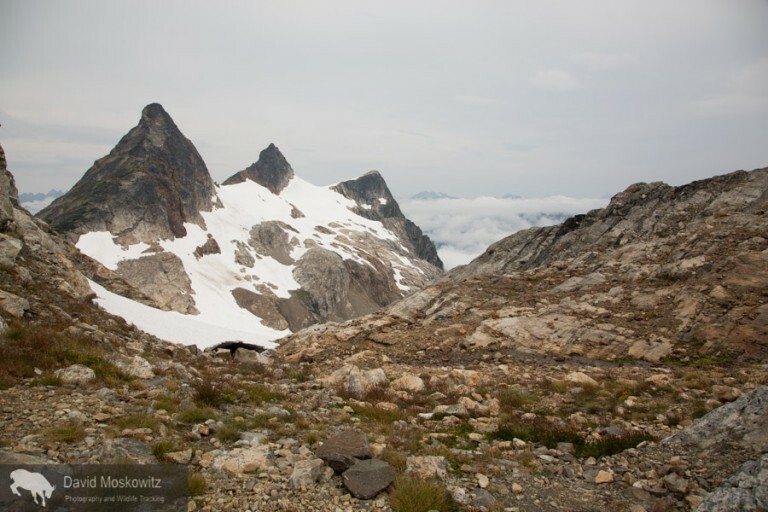 In August, Darcy Ottey and I went to explore a corner of the North Cascades we had never been to: the high peaks and glaciers just above the the south end Diablo reservoir, off of the North Cascades Scenic Highway in northern Washington State. After years of seeing Colonial Peak from the Highway when driving through, we picked what turned out to be a stormy summer week to venture into the area. Hours of grinding up a steep but established climbers route through lower and mid elevation forests eventually popped us out above treeline on glacier carved slabs along a ridgeline leading towards Pyramid Peak. 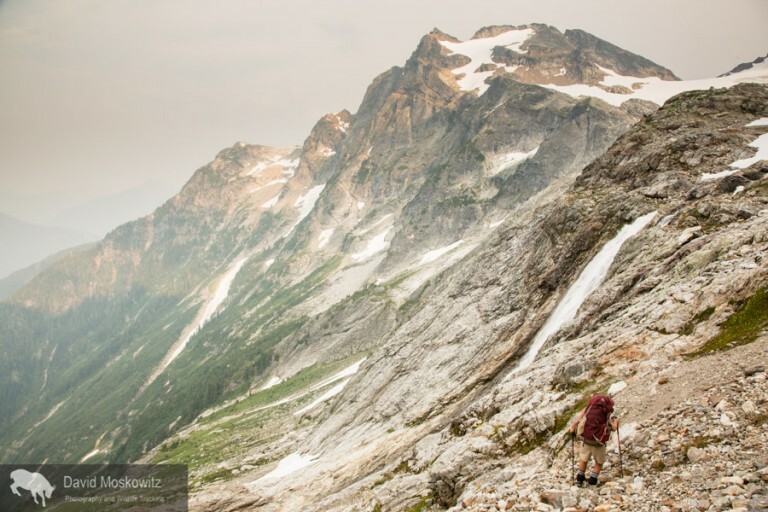 From hear a short traverse across talus and old avalanche debris got us to the entrance to a glaciated citadel of mountains—the upper Colonial Creek cirque. Camp on the edge of the recently formed lake at the terminous of the Colonial glacier. A blanket of clouds cover lower elevations in the North Cascades with high peaks sitting like islands in the sea at sunrise. The image is similar to how these mountains often appeared during the ice age when glaciers often covered lower elevations in much the same way. Not surprisingly, when we reached where the map noted the snout of the Colonial glacier should be we found no ice. The glacier, like most glaciers in the North Cascades (and indeed across the planet), has receded significantly. Nearly a quarter mile up stream we found the new terminus of the glacier, where it ends in a newly exposed lake, in a depression carved out by the glacier and now filled with melt water and icebergs—detached chunks of the crumbling glacier. Thunderstorms roiled a we elected to avoid campsites on the exposed rock prow above the lake, instead choosing to set up camp on the only flat spot we could find adjacent to the lake. Receeding glaciers leave behind moonscapes of scoured bedrock covered with piles of rubble and rock flour. Glacial ice exposed at the very top of the Colonial glacier (upper left of this photo) suggests that this glacier no longer has an accumulation zone. Under current conditions, it is just a matter of time before the glacier disappears completeley–perhaps within the next several decades. Current maps show glacial ice extending much further down then where the actual terminous of the glacier is now. The retreat of the glacier has created this newly formed lake. Chunks of glacial ice still float in the lake, demonstrating how quickly this landscape is changing due to shifts in the climate. Glacial lakes such as this one are filled with large amounts of ground rock powder giving the water a dark milky green appearance. 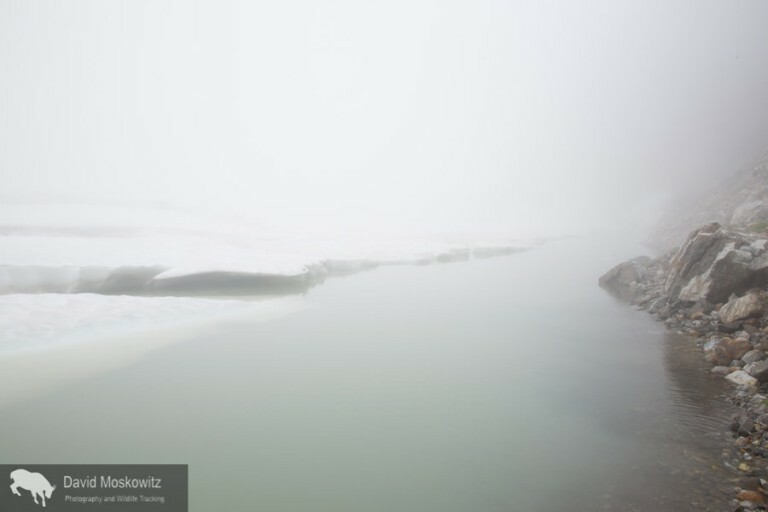 Earth, sky and water merge with a heavy fog sitting over the snow and ice choked glacial lake. Inclement weather dashed our plans for several peak climbs but did not deter us from venturing further south, over the Colonial glacier and onto the Neve glacier. 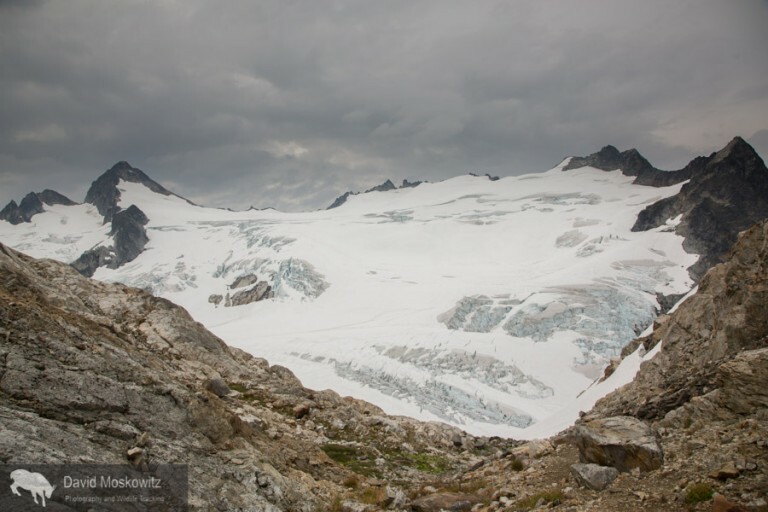 The vast exapanse of one of the largest glaciers in the North Cascades, the Neve Glacier with Snowfield Peak sitting at its head, on the left side of the frame. 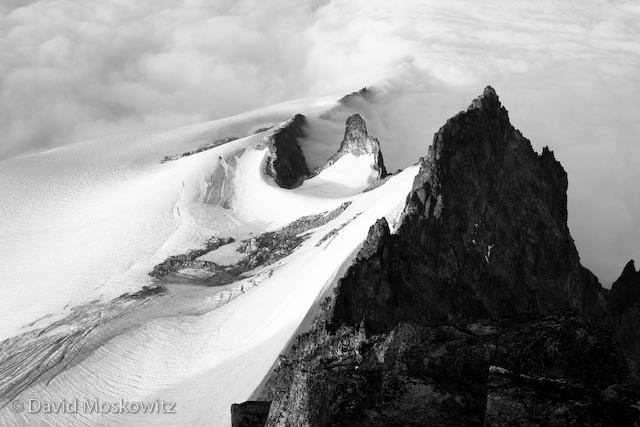 Seen from the Neve-Colonial glaicer col.
Darcy Ottey descending onto the Neve Glacier as a cloud rols over the glacier. Heading into a cloud on the glacier. On the broad expanse of the glacier, the peaks and landmarks disappear leaving an eerie world with land and sky blending together into a world of white. Paul Bunyon’s Stump, Pinnicle, and Pyramid peaks from Colonial-Neve glacier col. Looking north from the area into the upper Skagit river valley. Ross Lake, a large reservoir built to provide hydro-electric power for the city of Seattle is a more obvious sign of our species quest for energy then the retreating glaciers of the region but both reflect the long reach of modern human’s influence on even the most wild and rugged landscapes in the world. 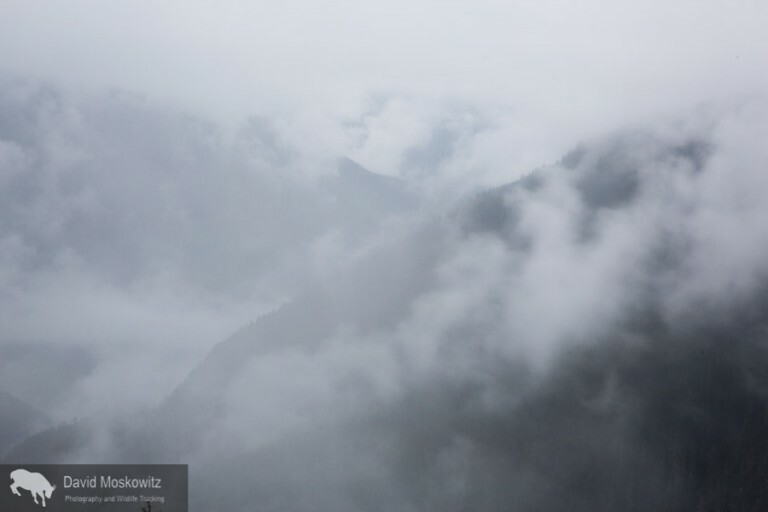 Descending into the clouds from the glacial cirque back into the forests of the North Cascades. Sections of forests on the western slope of the North Cascades get enough precipitation to qualify as temperate rainforest. Only 10,000 years ago these slopes likely appeared much like the higher elevations do now, having just been released from retreating glaicers which filled the mountains and flowed down into the ocean. 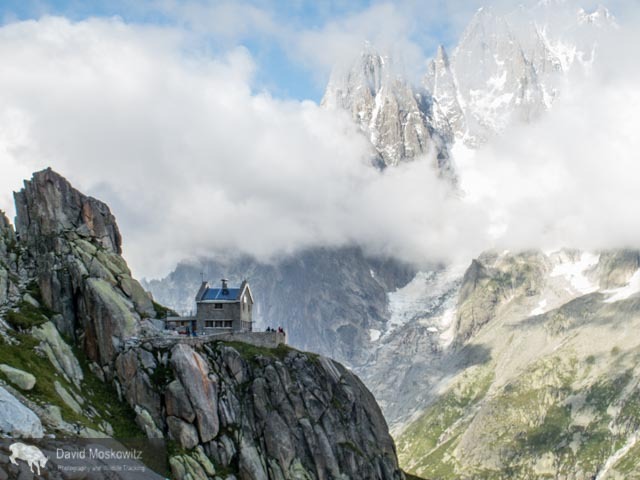 Climate models predict these mountains to get warmer and wetter in the decades to come. Glaciers will retreat and forests will advance unslope in an ongoing advance of forests through these mountains which began millenia ago. 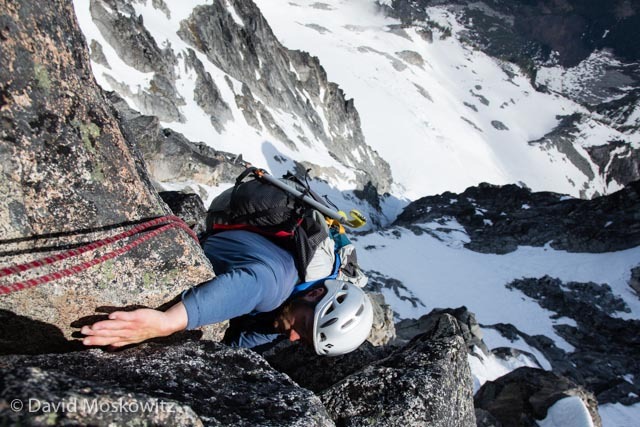 In early June, two colleagues of mine from Northwest Outward Bound School, Trever Waage and Joel Reid, and I set off to climb the Stuart Glacier Couloir, a classic steep snow/ice and rock route on the north side of Mount Stuart, one of the tallest non-volcanic peaks in the Cascades. We made our camp at the base of the Sherpa and Ice Cliff glaciers close to where our descent route would return us to at the end of the route. For the alpine start we were planning for summit day we turned in early. We crossed the Stuart Glacier in the dark, having left camp around 2 AM. Here Joel Reid navigates a crevasse on the glacier by headlamp. We crossed the burgshrund on the top of the glacier at first light and ascended the lower section of the couloir, about 40-50 firm snow, which runs up the northwest face of the peak. At the narrowest section of the couloir are two steps of steeper terrain. 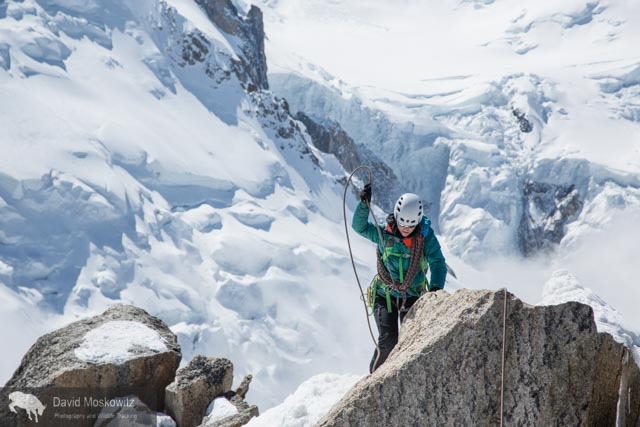 Here Joel Reid leads out to climb a pitch of mixed rock, ice, and snow with a belay from Trever Waage. Trevor lead the next step of ice. 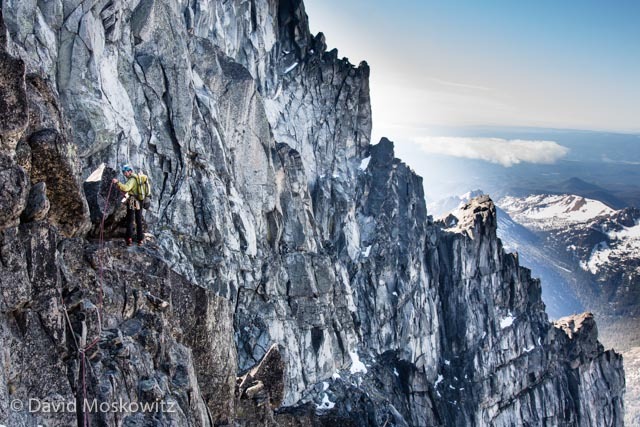 Joel and Trevor approach the top of the couloir on Mount Stuart’s west ridge. 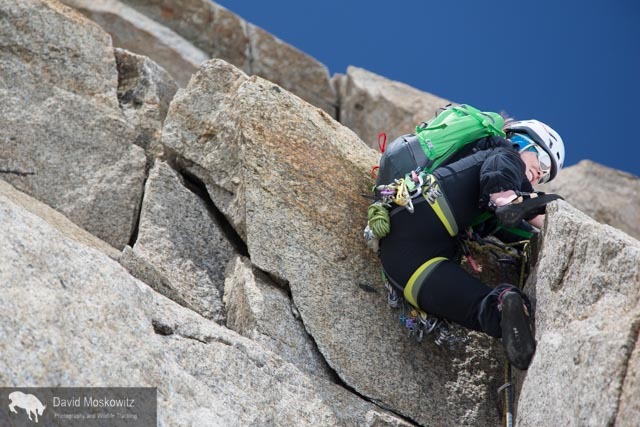 The route to the summit finishes on the West ridge; beautiful granite and stunning exposure. Trevor reaching for a good hand hold, high on the west ridge. The Stuart Glacier Couloir drops away below him. 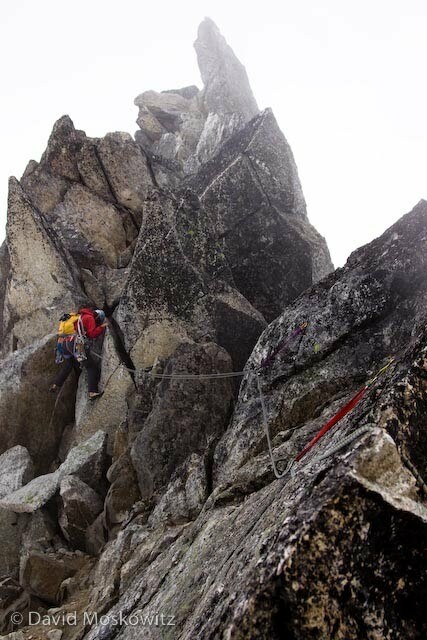 Joel Reid tops out on the summit of Mount Stuart. 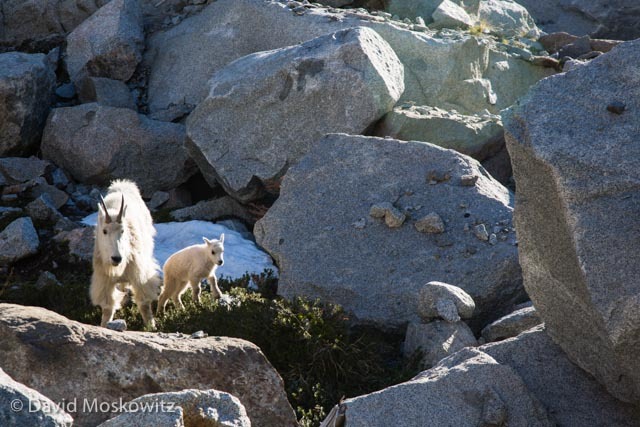 After a careful descent to the east and then down the Sherpa Glacier we made it back to our camp, greated by a family of mountain goats. Forest McBrian climbing into a col on the south side of Mount Fury. Forest McBrian hiking out of Luna Cirque with the massive north face of Mount Fury rising on the left and Luna lake below. Forest McBrian traversing south along the ridge leading to Picket Pass, what Fred Beckey might refer to as “pleasant hiking”. Forest on the Mustard glacier, part of our travel route over the southern Pickets. Forest making the transition from the icy glacier to the steep wet rock which lead to the col between the Ottohorn and Himelhorn peaks and our route out of the Pickets. This section of the route was the most technically challenging piece of the entire traverse in the conditions we encountered it. Last views to the north before we dropped down and south out of probably the most wild and remote section of the North Cascades. Mount Fury and Luna Peak in the distance. One last major obstacle descending south off of our last col, a steep gully (an eroded volcanic dike of which there were a number in the range which presented difficulties along the traverse) filled with large quantities of loose rocks. The light at the end of the chasm couldn’t come soon enough. Samantha Goff and Matt Chalmers, filled with anticipation at the start of our trip into the Eldorado Peak high camp. Samantha and Matt on the Inspiration Glacier on the approach to the West Arete of Eldorado Peak. Samantha at a belay ledge soon after getting on the arete, just above the layer of clouds which filled the Marble Creek drainage. Happy faces after enduring an unplanned bivouac high on the west face. Samantha looking up towards the summit as Matt leads the final pitch of the route. Dorado Needle and Early Morning Spire in the background. Looking south from the summit across a sea of clouds with only the highest peaks of the North Cascades jutting up like islands. Johannesburg Mountain in the foreground. The south ridge of Eldorado Peak and the Eldorado Glacier. Inspecting the descent off of the snow arete on the south ridge of Eldorado. Forbidden Peak, the Forbidden Glacier and Moraine Lake with part of the Inspiration Glacier in the foreground, taken from our camp at the base of Eldorado’s east ridge. Samantha leading out across the McAlester glacier towards Dorado Needle. Samantha navigating the north ridge of Dorado Needle. 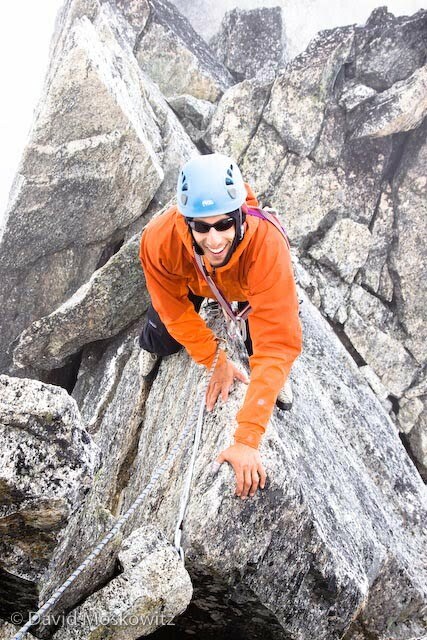 Myself at a belay ledge on Dorado Needle. The massive west face of Eldorado Peak briefly poked out of the clouds while we were on Dorado Needle. Samantha leading out on the final pitch on Dorado Needle. 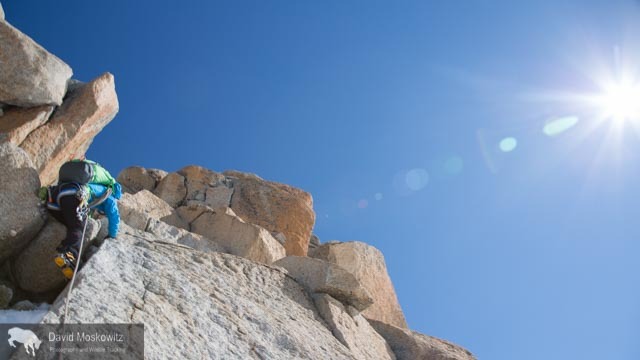 Matt navigating the final piece of the ridge, a knife edge section which he is climbing “au cheval”. Samantha belaying from just below the summit. Soaking wet from a long descent in pouring rain, Samantha completes a successful trip with the safe retrieval of several cans of Pabst Blue Ribbon beer from the Cascade River.